Come and see Ultra HD 4K in action at the Bristol Show – plus £10k of prizes to be won! | What Hi-Fi? Come and see Ultra HD 4K in action at the Bristol Show – plus £10k of prizes to be won! We're all set up and ready for the start of the Bristol Sound & Vision Show, with the doors opening at the Marriott Hotel in Lower Castle Street at 10am today. Please come and join us, it's going to be a fantastic show! As ever we're be based in the Bristol Suite, and this year's demo promises to be a corker: we're be showing 4K Ultra HD content on a Sony 84in KD-84X9005 4K Ultra HD TV! And we're be running it with a Yamaha RX-A3020 AV receiver, Marantz UD7007 Blu-ray player and Dali Epicon 7.2 speaker system. We also have some special subscription offers exclusively at the show, including QED cables and the NearFA TouchPlay 2 speaker for your smartphone. For a full rundown on what else will be launched at Bristol this year, see our dedicated show preview blog. 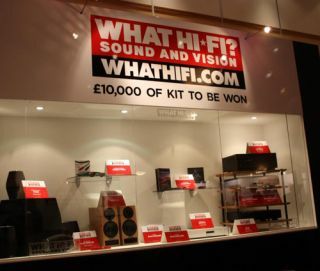 And check out some amazing deals on hi-fi and AV kit, only available this weekend.